Club Penguin Cheats by Mimo777 Club Penguin Cheats by Mimo777: Club Penguin Play Awards Nominees! 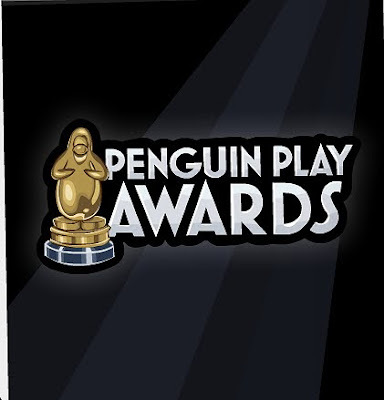 The Penguin Play Awards begin today, with the winning play at the Stage on March 30th! Remember, you can meet many famous penguins like Aunt Arctic, Cadence, and the Penguin Band attend the Penguin Play Awards! Woot! These are all pretty great plays, don't you think? We get to vote in the following categories: Best Play, Set, Music, Special Effects, and Costumes. Do you have a favorite? Which one will you be voting for? i kinda thought that fairy fables has like the best costumes, but the music is kinda annoying. well im going to vote for ruby and the ruby who are you going to vote for mimo? i will vote ruby and the ruby but i also like the quest for the golden puffle and the fairy fables hmmm i wonder which play will win?? i think that i shoud vote for ruby and the ruby for best play but voting for special effects is difficult as evrones special effect were hilarious!!! wow! didnt fairy fables win last year for best costume? i think they will win again! I like underwater adventure.But I wanted to tell you about the mine.You know the letter P on the rockslide?Remember Herberts full name?His full name is Herbert P. Bear.So I guess he dug the mine up.Also, remember where Rockhopper's ship broke?It was at ice berg.The underwater room is under ice berg because I can tell by the cream soda, and the tresure. Underwater Adventure was Pretty Awesome! Its about a Mer-man and a Mermaid. Go to the Plaza and Vote there! there will be a Booth waiting for you! WOOT! Last time the ones i voted for won! I hope the underwater adventure comes back coz thats my faviroute SO plz vote for it! Best Effects: Quest for the Golden Puffle! I think thats what I voted for..
Great theory, and also probably true! PEACyCrazi said....i kinda thought that fairy fables has like the best costumes, but the music is kinda annoying. thanks! i saw the chair you click and then vote! ty Dan! Mimo I think there is a little dent that makes club penguin unfun and uncool! People get super annoying! Example: People dress up like babies act all cute and stuff (at least that's what they think!). "Chews flipper" and they make up this word for mom! " Wammy! " It gets on my nerves! If you want proof, try going to the servers Alaska, Alphine or Abominable. Then go to the Pet shop! There you go!! my favourite play of all time is planet y but out of these it is underwater adventure! for Best Play, I voted for Ruby and the Ruby. All the rest I voted for Underwater Adventure. That had the best costumes by far. I REALLY hope that Squidzoid vs Shadow Guy and Gamma Gal or Quest for the Golden Puffle win. They win too much, and I really don't like them. I wish the penguin that time forgot was a nominee. Wow, I never noticed that.. but it makes alot of sense.. lol. Good thinking! !